I have said it once, and I will say it again. The Boy in the Bubble is likely to have more fun than Rinks as long as Ashley a.k.a. The Fun Police is around. And this past week confirmed my theory on this point. 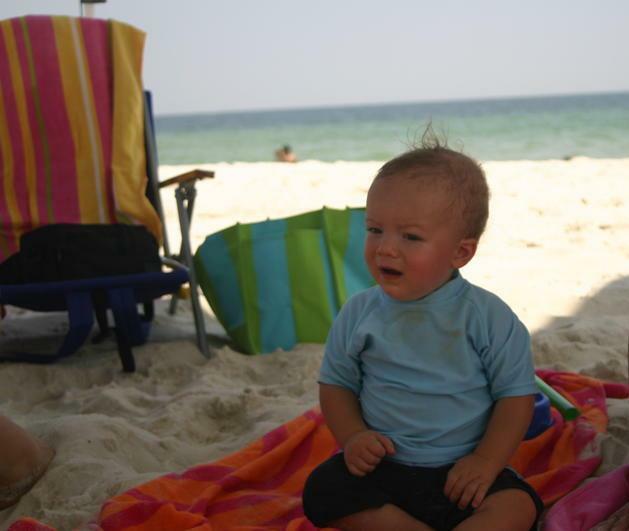 We decided to take a family vacation to the Gulf Shore beaches this week, never mind that it was burning like the 5th realm of hell, it was Rinks first trip to the beach and we were excited to see how he would react to it. So we pack up our 12 bags, beach tent, chairs, blankets, coolers, and walk down to the white sandy beaches for fun in the sun. I can see Ashley tense up as I slather SPF 100 on Rinks who is sitting on the blanket...under the tent... that is under a pier (can you see the picture being painted here?) So I begin to lay out Rinks toys as he makes his way to the edge of the blanket where he proceeds to eat the sand. I start laughing and taking pictures to document the world's most adorable moment. But then I look up to see Ashley literally rocking back and forth in his chair in a state of panic as he looks on at Rinks eating the earth's polluted salt. "What's wrong?" I ask, already knowing the answer. "He is getting sand all over him, it's in his mouth!" "That is so strange", I say feigning disbelief. "Since we are ON A BEACH." I have never been known for my subtlety, or empathy. Meanwhile Rinks is quickly becoming a human sand castle as sand makes its way into every crevice and he is giggling with delight. But the human fun-o-meter sounds his alarm at the sight of too much amusement and scoops up Rinks as he announces, "We're going to the pool... where it is clean." And so Captain Party Pooper marches our little sand crab up to the pool to "clean him off" with 12 other kids who have all just put the P in P-O-O-L. The Little Sand Crab himself.